I recently became enamored of Mailbox ( ) a currently Gmail-exclusive iPhone app that tries to make achieving the serenity of Inbox Zero a little easier. And now there’s another new iOS app for managing your inbox. It’s called Triage. 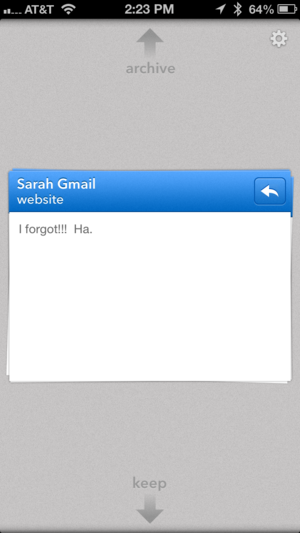 Unlike Mailbox or the built-in Mail app, Triage isn’t meant to function as a full-featured email client. It’s something else. Triage’s focus is on helping you to pare down the untamed mass of your inbox as quickly and efficiently as possible. When you have a few minutes, you can fire up Triage, and quickly deal with a few messages. Here’s how it works. First, you need to add one or more email accounts into Triage. The app supports Gmail, Yahoo, iCloud, and other IMAP accounts. Once your accounts are in, you begin to use the app in earnest. 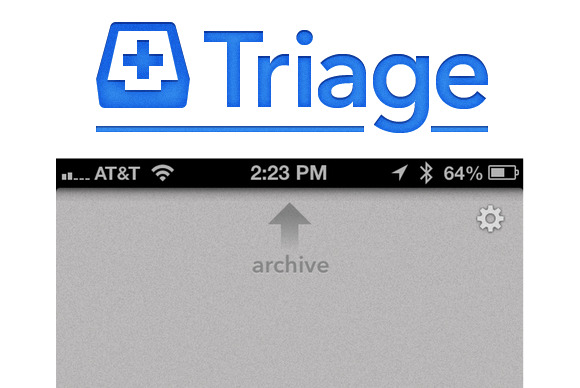 Flick a message up in Triage, and it's archived. Flick it down, and it's left alone—and still marked as unread, too. As you look at the topmost “card” in your stack of messages, you can interact with it in several ways: Flick it up towards the top of your screen, and the message is archived. Flick it downwards, and the messages is kept (and remains marked unread). And if you want to reply to or forward the message, you can tap the arrow to do so. If you can’t see enough of the message, you can tap on it to see the whole thing. That’s it. That’s all Triage does. And it’s pretty great. Triage can make very quick work of clearing out a clogged-up inbox. Flicking through messages that you just don’t need anymore, messages that you do need to give more attention to, and messages that you can quickly tap out a reply to is easy and painless. Should you prefer a different action—say, deleting or merely marking as read instead of archiving—that’s configurable in the app’s settings. You can also specify how far back into your inbox Triage should dig; the default is just seven days’ worth of messages. Oddly, though, such settings are specified on a per-account basis; I’d rather make my selections once and have them set for all my email accounts. I’d also love a unified inbox. There are some flaws and gaps in Triage: The reply functionality defaults to—and is limited to—Reply All. You can manually remove extra recipients, but I’d prefer a quicker option to reply directly (and only) to the sender. There’s also no option for specifying email signatures. Right now, then, at least for my usage, Triage feels like it’s built for consuming email more than replying to it. And it will only take a few minor tweaks for the app to feel like it can capably handle lots of quick replies, too. Despite a few shortcomings, Triage is already very good. It solves a specific problem in a clever way. You don’t need an app for this: You could manage your inbox as messages come in without a third-party app to help you along. But Triage makes it feel seamless, and even fun, to flick messages in the right direction and achieve—if not Inbox Zero—at least Inbox Zen. Makes quick work of clearing out the unread messages that otherwise pile up in your inbox.